· All nonfiction is equal and equally boring. And the articles that I excerpted these quotes from mention only long-form journalism as an example of high quality nonfiction; neither article mentions the existence of our genre of nonfiction literature for kids. · They don’t come with ancillary material such as lesson plans, and teacher’s guides and study questions. · Educators don’t understand how they support and fit into the curriculum. · Teachers are afraid to stray from the prescribed reading material for fear something might show up on the assessment tests that they should have “covered” but missed. · Teachers are over-worked, over-scheduled and have very little time to invest in doing something differently unless they know it will work. · Many educators have not taken the time to read even one of our books. Teachers have no time to read them. Librarians may beg teachers to work with them and pull books but often they don’t have much influence. · There is a LOT of confusion about the CCSS. Educators need to understand that the standards are in the way things are taught, not in the books themselves. Teaching from badly written material is NOT the way to teach kids to read to learn—one of the basic literacy skills of the CCSS. So they need to find out that our books are going to liberate them to teach with much more creativity, critical thinking and, yes, humanity. And reading is not just for ELA classes but for all subject areas. Our books are not competing with the teaching of fictional literature. · We are going to expand our membership to include you, our readers. If you were a member, what would you want from such a membership? We’re thinking lesson plans, book clubs with online discussions, a community of sharing and strategizing about using nonfiction in the classroom. · We will have the money to pay for high-quality lesson plans, and consultants, and passionate advocates and we invite you to participate. · We’re not yet sure how things will develop but we already have a mailing list of thousands of registered users for our database and will use it to keep you informed. 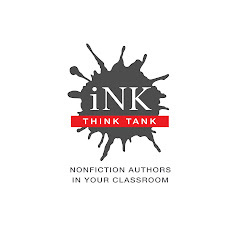 So if you’d like to be involved please register in the iNK Think Tank database and be sure to use an email address that won’t come up against a school firewall. It’s clear that we authors can’t fight this alone; we need your help. Please join us. Learning is a struggle, but the community that reads this blog knows that it can be a joyous one. It’s time to help the rest of the world find out. PS. Yesterday, I sent Roz's comments to Valerie Strauss at the Washington Post, who responded with interest. Here two posts of hers hot off the keyboard: Common Core Reading, Pros and Cons; and List: What Common Core Authors Suggest High-Schoolers Should Read. The fact that CCSS and the use of nonfiction is getting so much attention in The Washington Post and on various blogs is a good sign. We need to talk about this. Frankly, I found John T. Spencer's list of pros and cons in Commom Core teaching, printed in Valerie Strauss's December 4th article, to be clear and sensible. And, as he noted, this is not going to be s seismic shift in teaching. However, there will be changes. It is time we all got over the Appendix B issue. These books were listed as EXEMPLARS. They were not meant to define the books being used across the country. Granted, I wish the list had included more recent nonfiction as well as the tried and true AND in some instances the questionable choice. But, let's move on to promote the use of excellent nonfiction that teachers, parents, children, and authors can support. Vicki -- I had the same reastion when I read the NY Times article. While the author defended nonfiction (which was good), there was no real mention of what we do, and have been doing for years, with nonfiction. As for Appendix B, I've heard a number of people (writers mostly who aren't on the list) criticize and condemn it. My answer is that they really did need to give some examples and tried to put together a wide-ranging list (without creating one so long it would be daunting), but that they never said "these are the only books you should use." I assume there will be many such lists created in the next few years that will have more recent titles listed. It will be interesting to see who creates these lists and what is included (and I'm assuming that some textbook companies will be putting together their own lists -- catalogs? -- in order to stay in the game). Thanks for helping to jump-start this conversation, Vicki. It's an important one, because the problem with all of these newspaper-sponsored articles is that they ignore EVERY SINGLE ONE of the outstanding nonfiction books that have been written for a modern young audience during the past 15 years or so. This is a crying shame. Kids can relate to these incredible new books in a far more direct way than they can relate to ancient classic texts. And by the way, we authors don't ignore the classic material either. Among other things, today's nonfiction books do an outstanding job of incorporating the ideas from older material and putting them into context in an appealing, compelling, accurate, and astonishingly well- written way instead of hanging the original source material out to dry on its own. The new books turn kids on to reading and learning big time, not the other way around. So READ YOUR OWN NEWSPAPERS, journalists! You review these great nonfiction books in your own newspapers on the same days you write misleading material about what is or should be included in the Common Core! Thank you, Vicki and Roz. We need to educate the media, and emphasize that our innovative nonfiction titles are available to replace textbooks (which are boring).